Sunset Deer Lodge is a modern waterfront lodge that uniquely blends every modern amenity to compliment the true Tahoe experience. Centrally located in the Tahoe Keys, it's just minutes from World Class Skiing, Casinos, and Entertainment! Perfect for Vacations, Retreats, Honeymoons, Reunions and more! Boat Dock(s) for 3 boats up to 30ft. Views from every room of Mountains and Water indoor waterfall and BBQ Amazing wildlife viewing... watching the Bald Eagle fish right in front of you! Lake, water and majestic Sierra Mountain views from every room ! Spectacular sunsets over the Mountains every night! Mountains from every room! Great place to stay and an amazing host. We spent the Christmas holidays there for a family reunion. We only had 6 adults in our party, but the place easily fits 10+ adults. The property exceeded expectations. The place is very warm and inviting with great views from anywhere in the house. Awesome location with easy access to both town center and the ski slopes. We are already planning on staying here again! Absolutely loved this place. 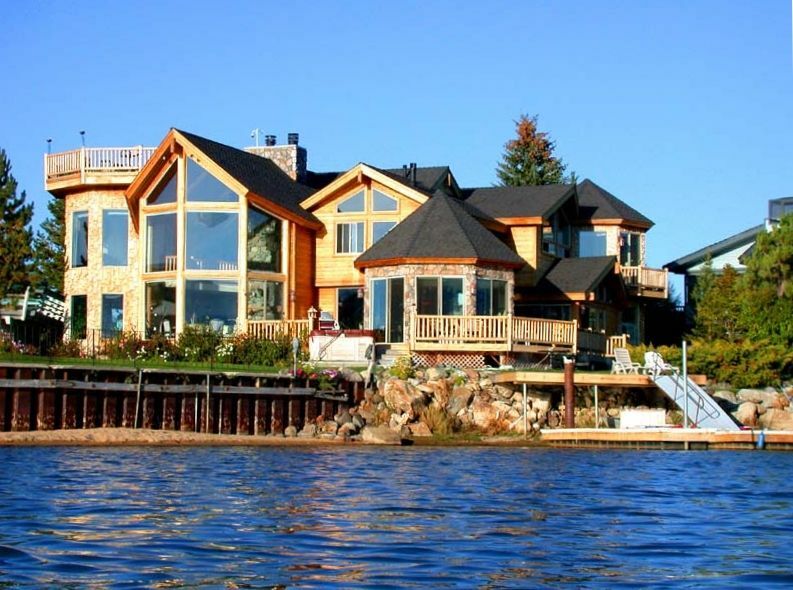 You could fish right off the dock on the property and watch the boats come in and out of the harbor from the house. The home was beautiful and very well kept. It was easy to access and had all the amenities you would need. Would highly recommend this place to others and it will be at the top of my list for future trips to Tahoe! My family of 16 had a wonderful, fun-filled summer vacation stay in this amazing, well-furnished lodge with incredible views. We had a few small issues, but the property management staff Lynn and Julie were very accommodating and friendly. Even though the lodge could use some TLC...it is amazing! As for the location it was perfect...It was minutes from shopping, restaurants, casinos, etc. There was so much to do we spent our week hiking, biking, boating, kayaking, river-rafting, fishing and so much more. Would we want to do this again...definitely! Beautiful home with great views and close access to the lake. Our family had a wonderful time at the lodge, it was spacious and well furnished. The views were amazing, especially from the roof top. My husband loved the fact that we could jump in the boat and get onto the lake in 3 min. and the same coming back. It was awesome! Our week was quite warm, so we did get a lot of the heat of the day especially in the bedrooms. The ceiling fans helped a little but the air conditioning didn't seem to work at all, maybe a couple of standing fans would have helped. There were also a lot of spiders and webs that could have been dusted off before our stay and a couple of the sliding door screens were broken, but other than those minor issues our stay was amazing and we would definitely rent again. Thank you Lynn!! This place is great. Awsome location right near the harbor exit makes getting on/off the lake quick and easy for breakfast or lunch while wakeboarding on the lake. Early morning is the best time to get out for water sport activities because the lake is as flat as glass. We got lots of wakeboarding and wakeskating in, while my father enjoyed a leisure water ski tow. Best dinner spot is near by as well, at the local marina. Fresh Ketch, gotta go there at least once and you will be coming back for more every night...first time I have seen Orange Roughy on the menu in a long time! Perfect retreat spot overall, lots of room to spread out and enjoy a relaxing family vacation. Interior design makes you feel cozy and warm with unique accents all over, even a singing moose near the entrance. Lots of activities to to all around town from hot air balloon rides, boat rentals, golfing, hot springs, hiking, bicycle riding, skydiving, or winter activities on the mountains. Great views from the roof deck that comes with hot tub and fire place. Downstairs deck comes with a nice grill for cooking up some delicious locally butchered wild game or plain jane rib eye steaks. When you get too tired to climb the spiral staircase to the roof, there is always another hot tub on the first floor deck as well. Boat dock was really nice too, you can dock 4 boats easy and it comes with 2 canoes and paddle board. We never even stepped foot into a casino the whole time since we were so exhausted, in a good way, from being active all day long. If you get a chance check out Emrald Bay and hike up to Cascade waterfall, you will not regret it! Thank you Lynn!!! 10 minutes to Heavenly Valley, 1 minute from your Boat Dock to Waterskiing on Lake Tahoe, (Tahoe Keys amenities, 3 Tennis Courts, Full size Swimming Pool), Fishing Charters 5 minutes from Marina, Tons of World Class Restaurants, Swimming in the Lake Tahoe, Casinos, and Entertainment! $1,000.00 - $2,000.00 per night based on dates, length of stay and # of People Subject to change until booked Please Call direct for Personalized quote! 1/3 to secure reservation Balance 30 days prior to occupancy Refundable Security Deposit covers Damage and/or Police action This a an Owner directed Rental, we welcome, recommend Guests to call and talk to us regarding their stay.